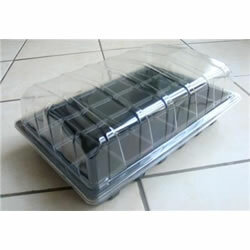 Three good quality and great value seed propagator set made from recyclable plastic. Used extensively by commercial growers. 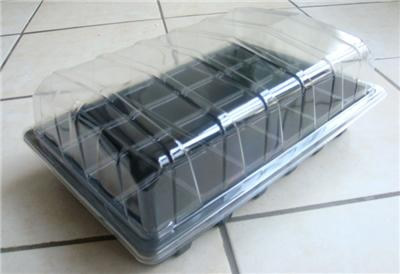 Contains standard sized tray with no drainage holes, a cavity insert with 40 cells and drainage holes, and a flexible, clear plastic lid. Tray measures 38cm (15") x 25cm (9.5") x 5cm (2") deep. Lid is 8cm (3") at highest point. Sold & dispatched by Nutley's Kitchen Gardens.